In the past 12 months, journalists in South Asia have experienced a crackdown on rights, an increase in intimidation and have simultaneously been at the vanguard of struggles for democracy and press freedom. "Dangerous and difficult are the two words which sum up the daily reality for journalists and media workers in South Asia," said Jacqueline Park, director, International Federation of Journalists (IFJ) Asia-Pacific. 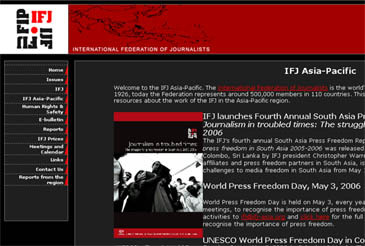 The IFJ's fourth annual South Asia Press Freedom Report: Journalism in troubled times: The struggle for press freedom in South Asia 2005-2006, produced on behalf of the South Asia Media Solidarity Network (SAMSN) and supported by UNESCO, documents the major challenges to media freedom in South Asia and explains trends and specific incidents — both positive and negative. A comprehensive list of cases of media freedom violations and attacks on journalists from May 2005 to April 2006 has also been compiled. The report contains stories of courage and professionalism by our colleagues across the region: journalists in Nepal at the forefront of the opposition to the royal coup, and its clampdown on press freedom and democratic rights; courageous Bangladeshi journalists exposing the corruption that pervades the country despite continuing horrific violence; Indian journalists in conflict prone-Kashmir and the north east facing the ire of both militants and security forces; media persons in Pakistan and Afghanistan resisting religious fundamentalism in the shape of blasphemy laws; in Sri Lanka media workers supporting holistic media reform initiatives in a country ravaged by conflict and more recently, the tsunami. For the first time, the report includes reports from Bhutan and the Maldives - where democratic forces in these tiny nations are struggling for press freedom and challenging autocratic rule. The report is testament to the professional solidarity among journalists in South Asia. "The solidarity shown by the SAMSN and journalists' organisations all over the region is commendable and shows a deep understanding that journalists need to support each other to do their job in safety, and to continue to stand up against the perpetrators of violence and obstructers of press freedom," said Park. "Highlighting the press freedom situation in South Asia and bringing attention to the violence against journalists in these countries is vital to ensuring a move towards a more free and democratic press, where journalists are able to report without fear or favour," said Park.